I’m not sure what caught my eye first in Let’s Get Lost. The road trip, the idea of a girl fixing everything and, everyone on her way, this great cover, or the “For readers on John Green“, calling out to me? Probably a little bit of everything, and, after reading it, I can say I wasn’t disappointed, at all. Let’s Get Lost is five stories into one. When opening the book, we enter into Hudson’s life, an only child living with his father, and helping him at the garage, hopefully soon nailing an interview at a great college he wants to enroll to. Then there’s Leila, a secondary character in Hudson’s story, coming to him to fix her car for the big road trip she’s planning, across America, by herself. Without, or maybe meaning to, Leila will turn Hudson’s life upside down, in a matter of 60 pages. Then it’s Bree’s turn, and Elliot, and Sonia. In this originally told story, we get a glimpse into four character’s lives, and we get to understand in a few pages their struggles, their hopes, their broken dreams, or the ones they still have to fulfill. Four different lives, with all one thing in common : Leila. This strange girl, on a road trip to see the Northern Lights, encounters each of them, and helps them with whatever they are going through. From a stranger, she becomes a friend, a helping hand, or even more than that. From reading the synopsis, I thought this would be Leila’s story. But it isn’t, well, not entirely. The originality of this book lies in the synopsis. We get five stories in one, and a glimpse into each of those character’s lives. We have just enough time to get to know them, and their struggles. All of the characters seemed realistic to me, and each of them were dealing with realistic problems. Scared about the future, or scared of looking back at the past, of taking another chance, or giving one… Everyone in this story has flaws and issues, some bigger than others. Despite the short stories, I had no problems getting attached to each of the characters, even if I wish I could see a little farther into the future what they’ve become. We get to know them, and, in a second, they’re gone. We’re thrown away a few kilometers later, a little farther on the road, with a new aquaintance. This can be bothering for some people, I understand, but for me it was one of the strong point of this book, and what makes me keep on reading. What’s happening next, what other adventure will we be taken on next? Every sixty pages or so, you’re brought into a new adventure, with a new setting, a new character. Every story, and every new point of view brought something to the story. It’s a shame, though, that we’re not in Leila’s point of view the whole time. She’s the glue holding the whole story together, she’s the one, getting lost, if I may refer to the title of this book. I would have enjoyed to see what she thought, and why she acted this way, in every adventure, with all the characters she encounted. However, this choice of putting the others in the front, and Leila a little bit on the background, creates an intriguing atmosphere in this story : we don’t know, until the end of the book, why she’s making this road trip, who she really is, what’s her goal, what’s on her mind, and every other question we can ask ourselves while reading this book. We see her from four different characters’ eyes, before finally seeing her with our own eyes. I can see why Fresh Fiction is quoting, for readers of John Green, on the cover of this book. Let’s Get Lost is a fast-paced read, dealing with profound themes, yet with lots of humor and fun. It’s a different story that let us into characters lives, and leave us wondering about the glue holding it together until the last chapter. I loved the idea of a girl being able to change someone’s life by just crossing it, at the right time. And I agree with Ali Alsaid : travelling really helps you discover who you really are, what you really want, what matters the most. Even if Leila was the one travelling in this book, all characters were on their own journey, and, by taking them with her for a little while, Leila did put them on the right path. An amazing, light read for summer, Let’s Get Lost surely convinced me to pick up another book by Ali Alsaid. With holidays right around the corner, I advice you to pick up Let’s Get Lost. Because, even if you don’t plan on travelling, this book will surely do what travels does best : help you discover yourself, encounter great characters, and take you on a journey you shouldn’t forget. Did you read Let’s Get Lost? What did you think about it? If not, are you planning to read it? Feel free to share your thoughts in comments! 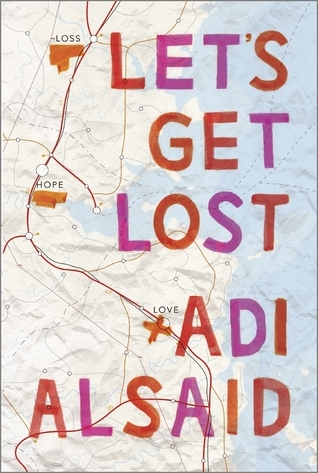 Adi Alsaid, Let’s Get Lost, Published by Harlequin Teen, June 29th 2014. ❤ I'm sure I will!